A Special Thanks to Kathy Yunker of Assiniboine Credit Union! It was extremely rewarding to have the Jubilee Fund auction off one of my largest pieces entitled "Lunaar". Congratulations and a special thanks to Kathy Yunker of Assiniboine Credit Union for purchasing this wonderful piece of art for her home! 100% of the sale proceeds go towards the Jubilee Fund to provide financial backing to entrepreneurs in the Winnipeg community who cannot qualify for traditional financing. 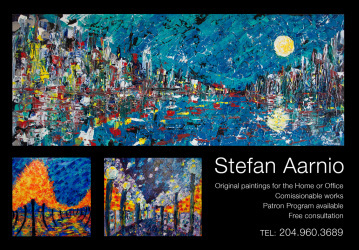 Local Winnipeg Artist, Real Estate Developer and Entrepreneur Stefan Aarnio has launched a program open to all charities in the City of Winnipeg, Manitoba. 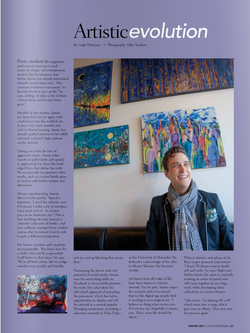 Although successful at selling his art locally for profit, Mr. Aarnio's successes in Real Estate have allowed him to produce Art that is no longer commercially for sale.